What is a hero? The ancient Greeks considered a hero to be a child of the gods. Webster’s Dictionary says that a hero possesses great strength and courage. For California State Parks Peace Officer Lifeguards and Rangers, the definition of hero or heroine is merely another aspect of their daily jobs. During every shift, a ranger or lifeguard may be called upon to find a missing child, to arrest a lawbreaker, or to save a life. Lifeguards and rangers gladly take an oath to serve, often at great peril to themselves. Their extraordinary heroism often goes unnoticed; however, some of our heroes and heroines have been nominated and received recognition from California’s Governor. 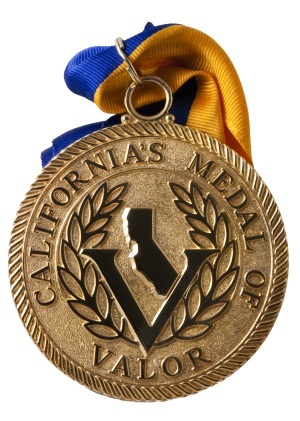 The Governor's State Employee Medal of Valor Award is the highest honor that the State of California bestows on its public servants. 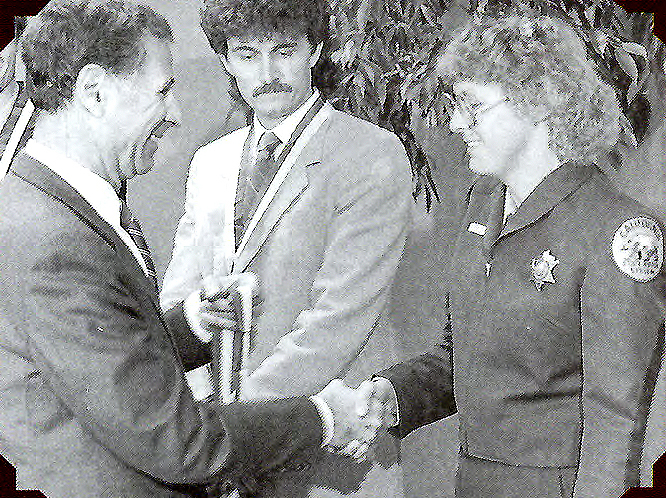 Nearly 550 medals have been awarded to State employees since the first award ceremony in 1959. Twenty-seven of those awards have been made to California State Parks employees. Here are the stories of just a few of these heroes: Chuck Grennell, Bonnie Morse, Tim Murphy and James Nothhelfer. The Governor's State Employee Medal of Valor Special Act Award (Gold) is given for an extraordinary act of heroism by a State employee extending far above and beyond the normal call of duty or service, performed at great risk to his or her own life in an effort to save human life. 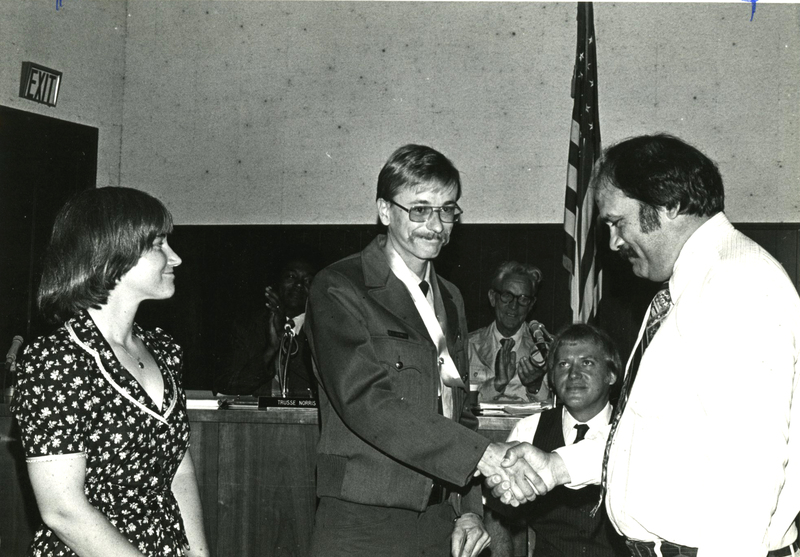 On March 25, 1978, State Park Ranger Charles E. Grennell, accompanied by three other rangers, responded to an emergency call of “swimmers in distress” at Sunset State Beach. Upon reaching the beach, Ranger Grennell checked with the first swimmer, who had reached the shore safely and learned another swimmer was in trouble. Removing only his gun belt and boots, Ranger Grennell entered the heavy surf and swam out to the second victim—bringing him close enough to shore for a fellow ranger to carry him to the beach and administer oxygen. By this time, an Army helicopter had arrived on the scene and requested assistance in retrieving a third victim, who was approximately two hundred yards from shore, lying face down in the water. Ranger Grennell again volunteered to assist, despite the dangers of strong rip currents. Lowered into the choppy water in a helicopter rescue basket, Ranger Grennell, exhausted and cold, placed the victim partially into the basket. The victim fell out of the basket and Ranger Grennell again attempted to effect a rescue. Although the third victim had already expired before the Army helicopter arrived, Chuck did his best to recover the man. Chuck is modest about his award, noting that he was merely doing his job. On June 11, 1984, State Park Technician Bonnie Morse responded to a report of a capsized boat in the Salton Sea with three elderly fishermen, imperiled by strong waves, calling for help. After requesting backup, Ms. Morse rushed to Sneakers Beach where she observed one of the victims clinging to a floatation cushion approximately 25 yards from shore. Without hesitation, Ms. Morse entered the water and brought the man safely to shore. Leaving him in the care of others, she again entered the water and with the floatation cushion swam out to rescue his companions who were clinging to the bow of the boat approximately 100 yards from shore. Upon reaching the victims, she kept them calm with words of encouragement while a rescue boat maneuvered into position. As the boat drew closer, Ms. Morse grabbed the mooring line, assisted in positioning the boat, and helped lift both men safely into the rescue craft. Morse was an entry-level State Parks Peace Officer/Ranger—then called a State Parks Technician—when she was called to assist the three fisherman floating in the Salton Sea. A lifelong swimmer, Bonnie had anticipated and thought through the possibility of such an event; when the call came, she locked her ranger vehicle, slipped off her shoes and plunged into Salton Sea. She steadily called to the first victim, reassuring him that he would be fine if he continued to cling to the cushion, not to her, in the buoyant saline water. Bonnie methodically helped all the victims to safety, expecting neither acknowledgement nor reward. On April 6, 1996, State Park Supervising Ranger Michael Stephenson and State Park Peace Officer Lifeguard Timothy Murphy, both off duty, responded separately to a report of a surfer stranded on a rock and waving for help at Sonoma State Beach. Upon arrival, Ranger Stephenson was able to get a glimpse of the stranded man just before darkness set in. The extremely strong surf, fog, and darkness precluded the use of paddleboards, boats or helicopters: the rescue could only be accomplished by swimming out to the victim in the 50 degree water. Ranger Stephenson and Lifeguard Murphy put on their swim fins and wetsuits, which would keep them warm for only about 20 minutes, and swam the half mile to the victim. Despite total darkness and strong currents, the rescuers were able to get the man safely off the rock. Because the prevailing current was carrying them toward a prominent rock outcropping being pounded by heavy waves, the rescuers, in total darkness, had to tow the man to shore against the current using a rescue buoy. After forty minutes, they reached the point just seaward of the pounding surf. A light powered by a generator guided them to the general direction of the shore; however, upon arriving on shore, the light suddenly went out. 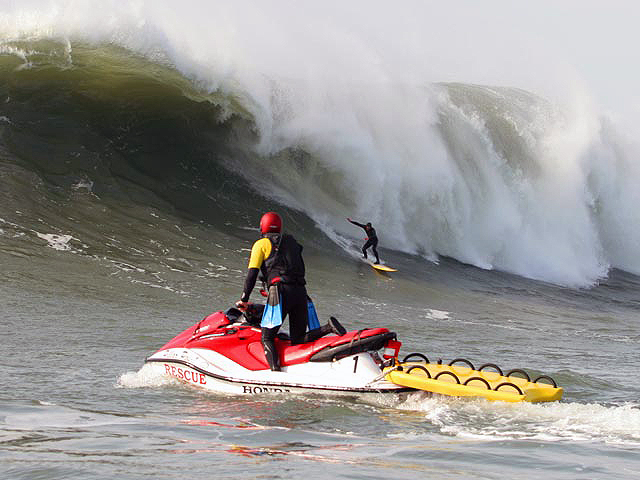 At this point all three were picked up and crushed by a twelve-foot wave, causing Ranger Stephenson and Lifeguard Murphy to lose contact with the victim. Lifeguard Murphy was able to quickly grab the victim and get him to safety on shore; Ranger Stephenson, however, was sucked back into the water and struck repeatedly by large waves before making it to the beach. The rescuers had been in the ocean for approximately two and half hours. Once safely on shore, the rescuers and the surfer were examined by paramedics and released. On June 22, 2009, California State Park Peace Officers Lifeguard James W. Nothhelfer and Ranger Timothy B. Fellars responded to a report of an overturned boat off the Fitzgerald Marine Reserve near Moss Beach. This area is well known for causing boat accidents due to the hazardous, shallow reef. At approximately 1:00 p.m., Officer Nothhelfer arrived on the scene, put on his wetsuit, and began to paddle out toward the victims. Facing nine-foot choppy surf that was closely spaced due to the northwest winds that day with floating debris and gasoline caused from the overturned boat, Officer Nothhelfer made his way out through the rocky reef surf zone, approximately 300 yards offshore. Six family members, including a six-year-old boy, had all been tossed into the 54-degree water when their boat overturned. Gathering five of the six family members together on top of his rescue paddleboard, Officer Nothhelfer was able to locate the sixth member, who was clinging to the bow of the boat, and brought him back to the paddleboard just before the boat sank. Officer Nothhelfer was able to hold on to all of the family members until Ranger Fellars arrived on the scene to provide additional help. Ranger Fellars, a former Lifeguard with California State Parks, put his wetsuit on and swam out through the same dangerous area to assist Officer Nothhelfer. Despite being hit repeatedly by the surf, together they were able to hold on to the family members until all were transferred to a waiting patrol boat. After transport to the harbor, five of the family members were transported by ground ambulances to area hospitals and treated for hypothermia. The six-year-old boy was transported by medical helicopter to an area hospital for severe hypothermia and near drowning. Although tired from their efforts, Officer Nothhelfer and Ranger Fellars were not injured during this strenuous and dangerous ocean rescue. A complete list of California State Parks Medal of Valor recipients may be seen at http://medalofvalor.ca.gov/Results.aspx. For more about the Governor’s program, visit http://medalofvalor.ca.gov/AboutAwards.aspx.